Oran is a dreary port city where boredom disguises itself as contentment. Inhabitants go about their lives as though in a daze; not uncomfortable, not joyous. This is a place of greys. And then the plague comes. All gates are shut, and the town is sealed. No one will be leaving for a very long time. Uncountable rat corpses are coverings streets and doorsteps, men and women are coughing up blood, and thousands are dying. We follow Rieux, a doctor trying to do what he can to help, as lives are changed and the question of whether or not you have lived well becomes a much more immediate concern.As you can, this isn’t an always a cheerful read. It is engaging, though, despite being almost a polemic (or, to be more blunt, preachy), but as this is Camus that’s rather like complaining water is wet. The dialogue felt stilted and forced at times, though, but how much of that can be blamed on the translation from French I couldn’t say. The characters are well-drawn, with some fascinating motivations and painful backgrounds. I was actually surprised at how personal this often feels considering the heady subject matter, as individual worries are again and again at the centre of concern rather than society wide sweeping change. All stories come together to give readers a message that sounds extremely trite summarised. Big truths often do, though. 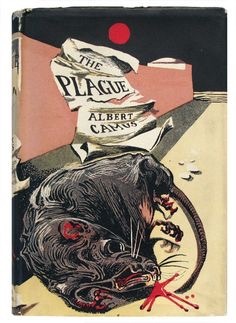 Camus makes us understand that only individual sacrifice can stop the plague (which, as might be obvious, is very much a metaphor), to stop pain from spreading if you possibly can. Heroism isn’t something that should be glorified to Camus, it’s merely what must be done. Ordinary people have no choice but to become exceptional, or their friends and family will go through gruesome ends. In fact, friends and family might die either way. But, even if defeat’s inevitable, we should still try to be good. This isn’t what I could exactly call an exciting read in the way The Stranger was, something which I raced through and made me question the way I looked at the world. It’s less direct than that, and as such maybe less impactful. All I can say is that three-hundred pages of misery somehow made me feel uplifted, and that’s an accomplishment.